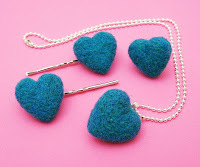 For those who like my line of felted heart jewelry, I just wanted to let you know that there will be a magnificent coupon code pertaining to it in my next newsletter. The January/February edition will be emailed to my subscribers on or before Friday of this week. If you don't want to miss out on this most excellent upcoming deal, then please subscribe to my newsletter and/or follow my blog. As far as the coupon code goes, it will be one of my best deals of the entire year, and definitely the best deal pertaining to my felted heart line. The coupon code will only be valid for a few set number of days because it is just so good that I can't let it go on for long. Can you tell that I'm very excited about this one?! Now I need to get organized, decide what else to put in the newsletter, and get busy with it. Friday will be here before I know it! I love it when I find a good forum, but lately I haven't really found any. I miss the old days of delphi forums - it seemed like there was more to choose from and people were a lot more thoughtful about it, in part because when someone sat down to a forum their full attention was invested. Now I think part of the reason Etsy forums have so much nastiness is the only way to gain full attention is with enticing negativity.